Construction on the John James Audubon Bridge came to a close late last month when the Louisiana Department of Transportation and Development completed the new Mississippi River crossing -- the longest cable-stayed bridge in the Western Hemisphere -- on time using an innovative contract tool. The main span, 1,583 feet long, is located on Louisiana 10 connecting West Feliciana Parish with Pointe Coupee Parish. It's the only bridge between Baton Rouge and Natchez, Mississippi. Construction on the $409 million project began in 2006. The bridge was opened to vehicle traffic in May 2011, replacing the old St. Francisville Ferry, but finishing touches continued until last month. "Although the Audubon Bridge has been open to traffic for nine months, it's with a great sense of accomplishment that we are announcing the end of construction on this beautiful structure," Louisiana Transportation and Development Secretary Sherri LeBas said in a statement. "The completion of this bridge opens economic development in south-central Louisiana and will be a source of regional, statewide, and national pride." Work was officially completed with the installation of the navigational clearance gauges, markers that indicate the vertical distance between the waterline and the lowest point of the bridge span in the navigational channel. The bridge, built under the first design/build contract in Louisiana DOTD history, was part of the Louisiana TIMED Program. It was constructed by Audubon Bridge Constructors, a joint venture of Flatiron Corp., Granite Construction, and Parsons Transportation Group. "Crews have done a first-class job on this bridge and its approach roadways," Louisiana TIMED Program Director Stephen Spohrer, said in a statement. With a 100-year lifespan, the Audubon Bridge will open the doors for commerce and travel for generations to come." 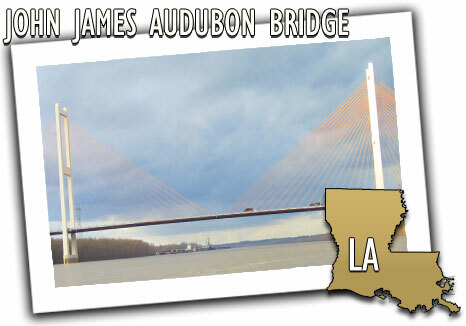 Louisiana's newest bridge is named after John James Audubon (1785-1851), one of the world's most renowned naturalist artists, who dedicated his life to painting all of the birds in America. Audubon painted 32 of his famous works in his "Birds of America" series while residing at Oakley Plantation in St. Francisville.